Generically speaking, a “broch” is a dry-stone roundhouse, built around 2000 years ago, that was used as a fortress, often incorporating community dwellings. 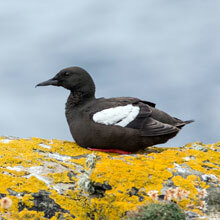 They are unique to the Atlantic coastline of Scotland. 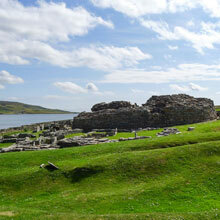 The broch at Gurness is situated on the north of Mainland, the biggest island of the Orkney archipelago. 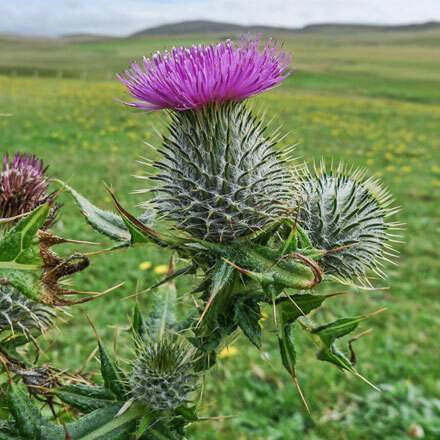 On the morning we visited, the weather was perfect for viewing the Broch and also for watching the surrounding flora and fauna. 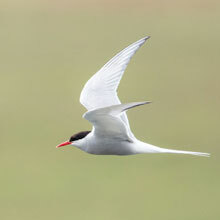 Some Arctic Terns were patrolling the Eynhallow Sound, the channel separating Mainland from the Isle of Rousay. 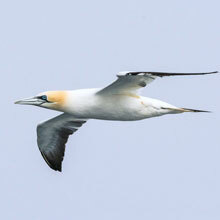 A pair of Gannets did likewise a short time later. As I explored the Broch remains, I heard some tourists getting excited about the appearance of a Common Seal that had briefly surfaced in the Sound. 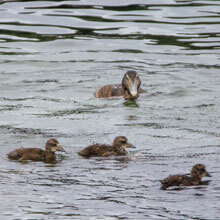 A female Eider flew past the Broch and later another passed rather more sedately as she guided her ducklings along the shoreline. 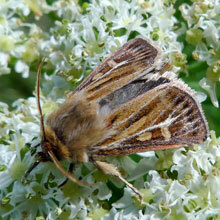 As I snapped some pictures of some pretty Common Ragwort I noticed an Antler Moth feeding on Hogweed. 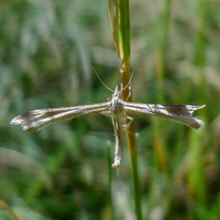 The antler-shaped marks on its upper wing give it its common name. 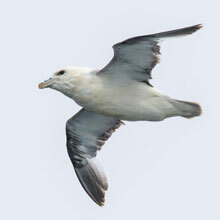 It flies during daylight hours. Unfortunately I timed our visit badly since it was high tide at our arrival, which meant we could only look across at the island. 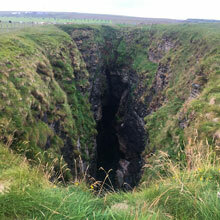 I contented myself with an exploration of the mile of coast immediately to the east of the car park. Luckily there were lots of things to see. 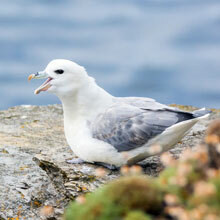 First up were the ubiquitous Fulmars, which I managed to photograph on their cliffside perches. 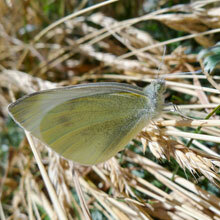 I also came across lots of Green-veined White butterflies in the bracken. Females were positioning themselves on leaves as the eager males sought them out. 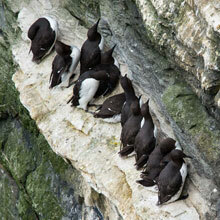 Some Black Guillemots sat lazily on an exposed cliff top. They seemed unconcerned with our presence. 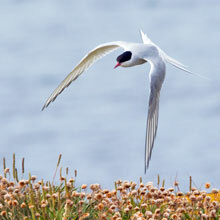 Conversely, a pair of quite aggressive Arctic Terns appeared on the scene, swooping threateningly close to our heads. 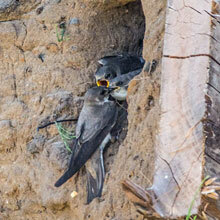 I got the message that we were too close to their nesting area, so we passed quickly by. 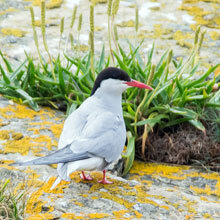 From a safer distance I managed to catch the Terns sitting on the same rock cliff as the Guillimots. 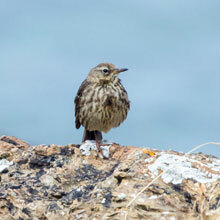 A Rock Pipit hopped into view and probably wondered what the fuss was about. About a kilometre from the car park we came upon an interesting hut that was built into the grassy banks at the top of a small cove. Surrounding the hut there were several large, puzzling indentations in the banks. It turns out that this was a 19th century fishermens’ rest and the indentations, called “nousts”, were used to hold their boats after they had been hauled up from the cove. 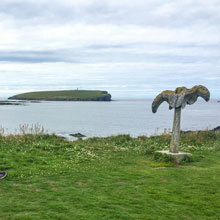 At the Point of Nether Queena 100m further on, there is a whalebone sculpture. 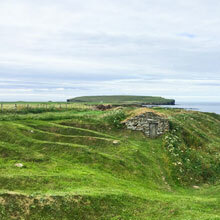 The picture below shows it with the Brough of Birsay in the background. The sculpture is all that remains of a Baleen whale that was washed up offshore in the 1870s. 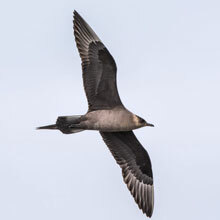 It was very grey, damp weather when I set out around the Mull Head Local Nature Reserve, which is at the east of Mainland, at the north of a peninsula called Deerness. Not far from the car park is a feature called The Gloup, which is a collapsed sea cave separated from the sea by an 80m land bridge. 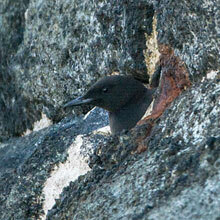 From a specially-build viewing platform I photographed a Black Guillemot sitting on high ledge overlooking the chasm. 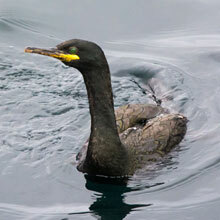 I moved onto the land bridge and, from my trusty 3-legged stool, I observed the movements of Cormorants, Black Guillemots and Shags, all of which were very active. 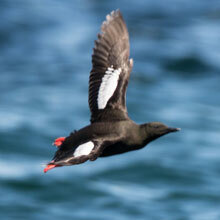 I saw a Black Guillemot carrying what looked like an eel. 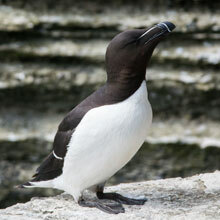 From there I trekked the few miles past some dramatic rocky shoreline towards the Head. Unfortunately I didn’t reach my destination as in order to access the last few hundred yards I needed to climb a stairway cut into the side of a cliff. It was like something out of an Indiana Jones movie, and wet into the bargain, so I gave it a miss. 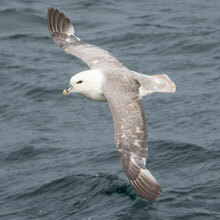 However I did manage some nice shots of Fulmar. 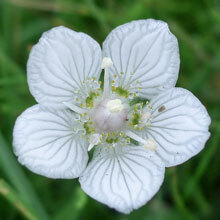 On my return trip I came across lovely flowers of the Grass of Parnassus. 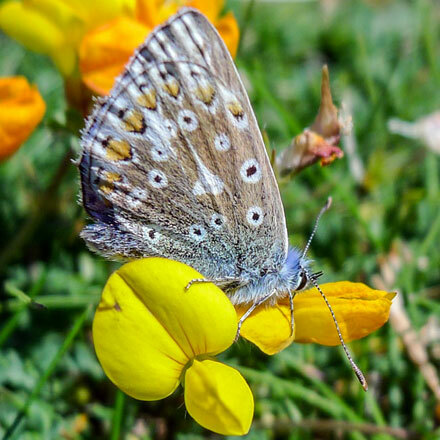 This very pretty flower, which smells like honey, is so-named after the story that cattle grazing on Mount Parnassus, in Greece, developed a taste for the plant, rather than grass. 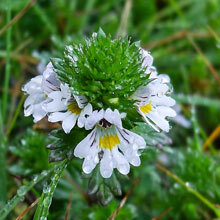 There were also lots of patches of Eyebright with its very tiny, but beautiful flowers. 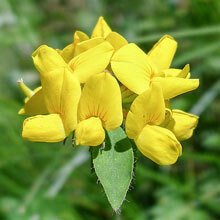 It is semi-parasitic as it often robs other plants of nutrients by surrounding and seeking them out with its roots. 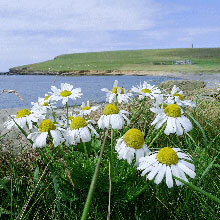 10 minutes drive from Stromness, Yesnaby is on the west coast of Mainland. 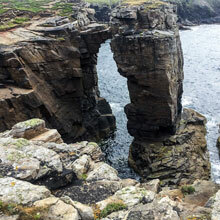 It is renowned for its dramatic old Red Sandstone cliffs and sea stacks. The car park looked like a former military station. 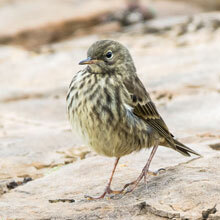 As we began our trek, Rock Pipits posed conveniently and the air was filled with Fulmars. 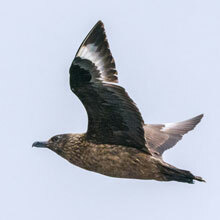 Great Skuas glided past every so often. 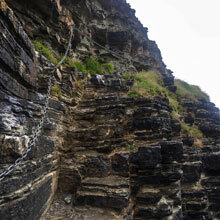 We reached the very impressive Castle Stack set in very rugged coastline. 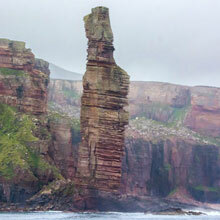 It stands on 2 legs and is 35m tall and has been described as a smaller version of the more famous Old Man of Hoy. 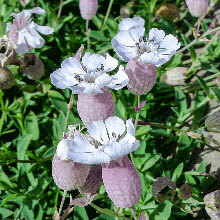 Yesnaby is a location where the fairly rare Scottish Primrose can be found. 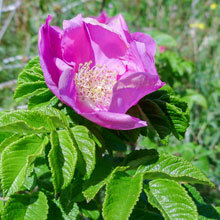 I had a good look for it but I think our visit was the wrong part of the season to catch the flower in bloom. 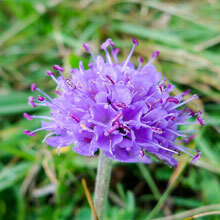 There were lots of Devil’s Bit Scabious and Spear Thistle. 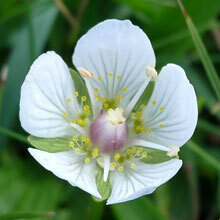 Like Mull Head, there were a fair number of Grass of Parnassus and Eyebright. I was disappointed that the weather when we set off was even more miserable than on our ferry trip onto Orkney. 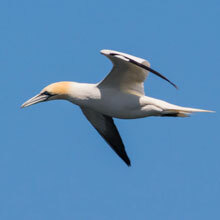 However as the crossing progressed, the light improved and I managed a few very satisfying shots of Gannets and Fulmars. 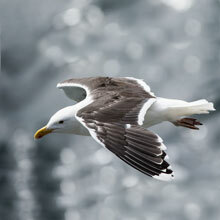 I also captured an image of a Kittiwake sweeping over the waves. 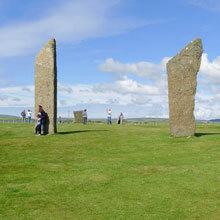 We were sad to leave the Orkney Isles as we had had many stimulating, exciting and entertaining experiences. 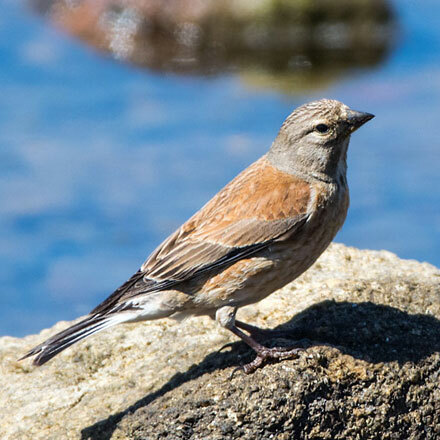 We concentrated most of our birdwatching efforts on the coastal areas, so there’s a strong possibility that I’ll return there in the future as I’d like to explore the inland areas of Mainland. 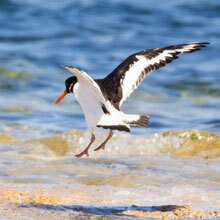 Also the other islands in the archipelago offer some very tempting sites. On Saturday 14th July my wife and I battered up the infamous A9, on a 10-day holiday in the North of Scotland. We were heading for Orkney but our plan was to break the journey with a 2-night stay in lovely Dornoch. 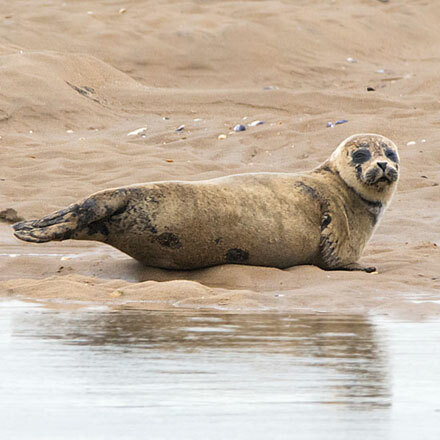 We spent Sunday visiting the nature reserve near there, at Loch Fleet where, despite some dull, drizzly weather, we were treated to magnificent views of Common and Grey Seals languishing on golden sands. 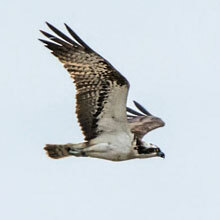 We were also lucky enough to glimpse views of an Osprey hunting for fish, but we were unlucky in that it didn’t treat us to a view of its fishing skills. In the afternoon we further sheltered from the rain by taking a tour of Dunrobin Castle, the home of the Duke of Sutherland, notorious for his role in the Highland Clearances. His huge hillside monument looms threateningly over the area. 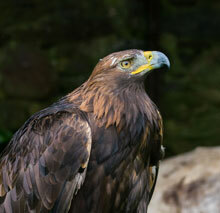 We attended a very enjoyable and informative falconry display in the Castle Gardens. 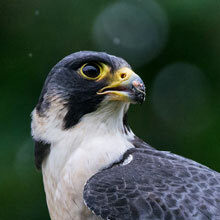 I usually dislike such things involving captured animals, but the skill of the falconer and the various raptors on show, such as Peregrine and Golden Eagle, certainly won me over. The next day we made the one and a half hour drive to Scrabster, near Thurso, and boarded the Orkney ferry, MV Hamnavoe, (“haven bay”), the ancient Norse name for Stromness, our destination port. The weather remained disappointingly drizzly, but as we passed the world famous rock stack, the Old Man of Hoy, we were greeted by a host of sea birds including Fulmars, Great Skuas (also known as Bonxies) and Gannets, as well as more distant views of Guillemots, Razorbills and Penguins (more of which later). After we had settled into our digs and explored Kirkwall we checked out RSPB Hobbister which is on the north-east edge of Scapa Flow , the natural harbour famous for its sheltered waters used by ships since ancient times and for the part it has played in travel, trade and conflict, especially during the World Wars. 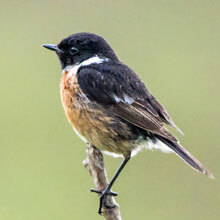 Unfortunately the rain did not show the reserve in its best light. 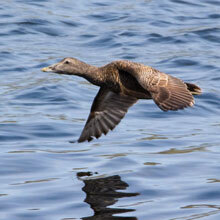 Also, young canoeists were active around the bay effectively clearing birds and other wildlife from the immediate area. 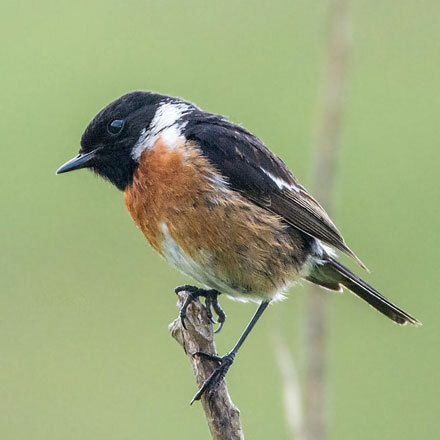 I did however manage some nice shots of a pair of not-so-shy Stonechats in bracken beside the the road. 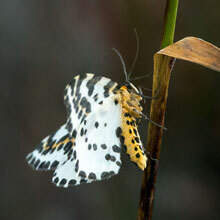 And a Magpie Moth caught my attention before darting into the bracken. 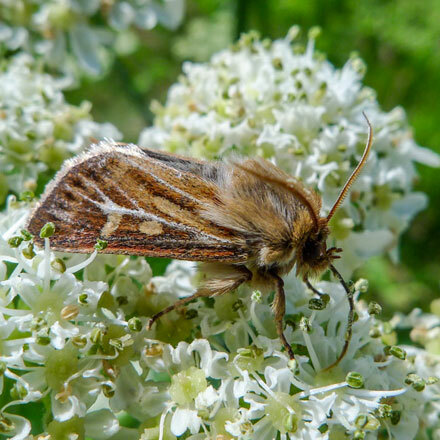 Looking quite butterfly-like, these Orkney moths apparently feeds on heather rather than the gooseberries favoured by Magpie Moths in the South. 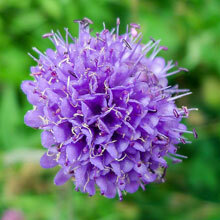 As I returned to the car I snapped a Devil’s Bit Scabious. 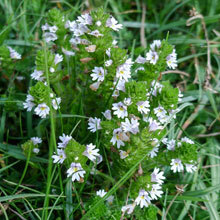 This plant is so-named after the fact that it was used in the treatment of scabies and other skin conditions. It's roots look as if they have been cut short - which, to the ancients, seemed to be the work of the Devil. The weather was much better in the afternoon, very bright, warm and dry. 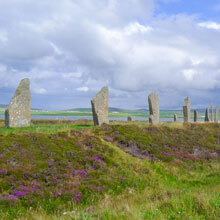 Most of our time was taken up by a visit to Ness of Brodgar, where a live archeological dig was in process. . Later we walked around a pair of ancient stone circles, the Stones of Stenness and the Ring of Brodgar. It all seemed a bit “Harry Potter”. 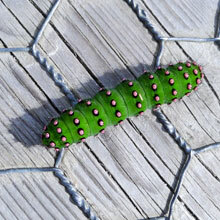 In the car park I came across the scary-looking wasp, Buathra Laborator, and a large, attractive caterpillar of the Emperor Moth which feeds on heather, bramble and blackthorn. 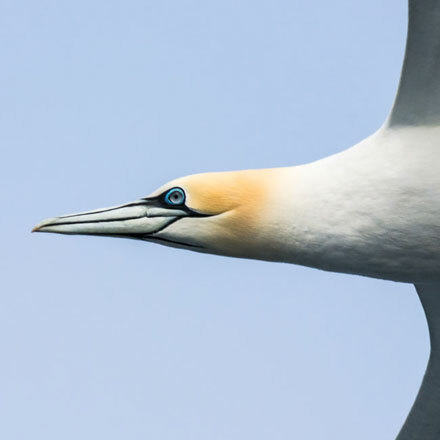 On the following afternoon I spent a few hours taking pictures around RSPB Marwick Head (my wife preferred to stay in the car with her knitting!). As I set off, I noticed the edges of the shore were lined with wildflowers, Oxeye Daisies, Sea Campion, Sea Sandwort and Marsh Woundwort. 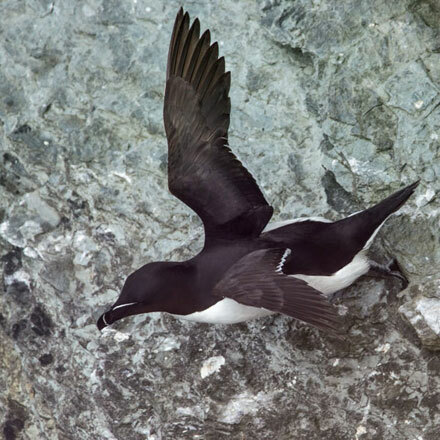 I paused to get some pictures of these before approaching the many collections of birds on and around the steep, high and dangerous sea cliffs. After I’d found a safe observation point by the cliffs I settled down on my trusty wee 3-legged stool and almost immediately saw a pair of Puffins no more than about 30 mts away. 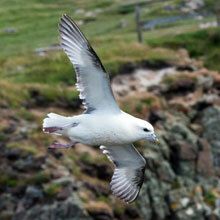 I could also see Razorbills, Fulmars and some Rock Doves. 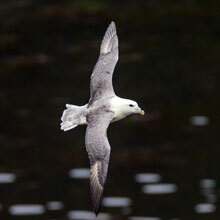 I climbed higher along the cliff top accompanied by a Great Black-backed Gull sitting on the air current. 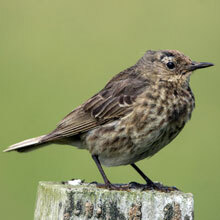 On a fence post to my right a very bold Rock Pipit paid me little heed despite my close proximity and the fierceness of the wind. 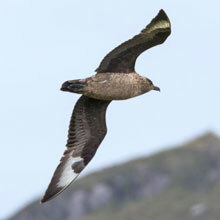 Just as I reached Kitchener’s Monument a bold Great Skua glided overhead. 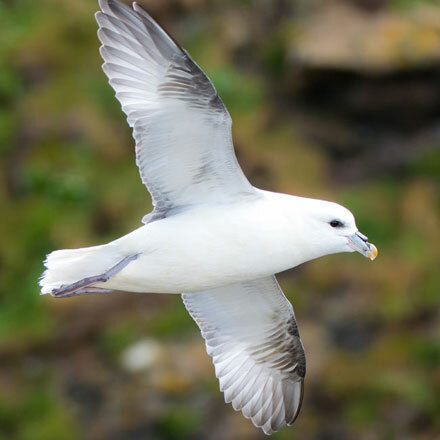 It was patrolling the cliffs seeking out tasty morsels, such as unattended chicks, but it passed without any success, much to the relief of the Guillemot colony clinging to the cliff walls. 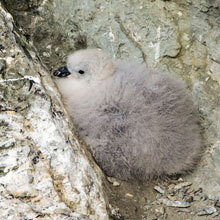 I spotted a Fulmar chick sitting on a rocky ledge. 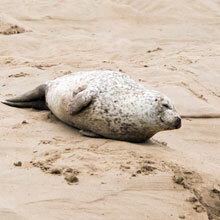 None of its parents were anywhere to be be seen, so it had had a lucky escape. 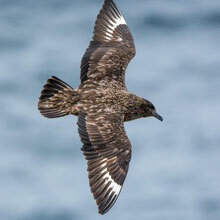 Its luck continued, as an Arctic Skua came on the scene. 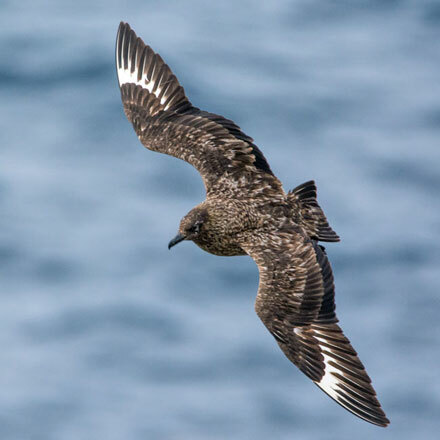 The Skua was being mobbed by some Terns and Crows, so I guess its attention was diverted from the cliff ledges to getting rid of the nuisance birds. On my return journey along the rocky margins of the shore I recorded images of Scots Lovage, a favourite of human foragers as its foliage can be used in salads and pasta sauces. 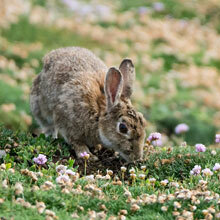 My final picture was of a nervous Rabbit nibbling grass in the field adjacent to the car park. 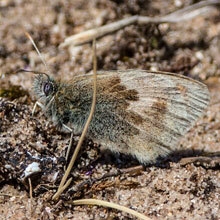 I’d have liked a closer shot but it darted down its burrow before I could get any closer. I hope you have enjoyed these ramblings. 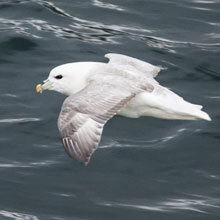 I’m pleased with the haul of sightings described above from the start of our holiday. I’ll cover the remainder of the holiday in a future blog. As the early summer heatwave extended into the second week of July, I must admit that part of my reasoning in deciding to opt for Gullane Bents on Sunday was the indication by the weatherman that it would be cooler in the east with broken spells of sunshine. We had our Dalkeith Morrisons’ breakfasts (disappointing 7.5/10) under grey skies but when we arrived at Gullane the sky was azure blue. We were in for another scorcher. Gullane Bents were already filling with day trippers complete with chairs, canoes, surfboards and barbies. All this cleared the area of wildlife, but we hoped that we’d find better nature watching conditions if we walked west over the rocky shore towards Aberlady LNR. And so it turned out. 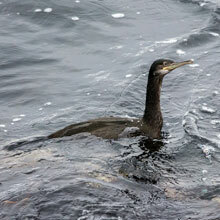 Soon an offshore Eider and a wee scurrying male Pied Wagtail raised our spirits. 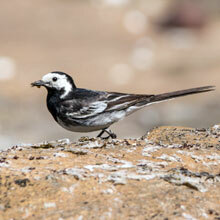 The Wagtail was catching flies as we could see by the contents of its beak. 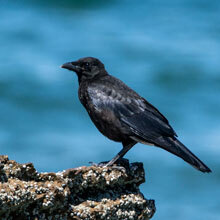 We were cautiously watched by a Carrion Crow as we moved towards Bleaching Rocks. 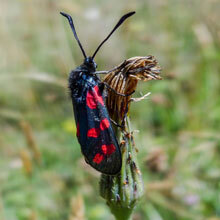 I snapped a 6-spot Burnet Moth as it clung to a Goat’s Beard bud, the first of many Burnets we would see. We were walking beneath grassy crags beyond which I could see banners set out on the Gullane golf course in preparation for the Scottish Open championship. 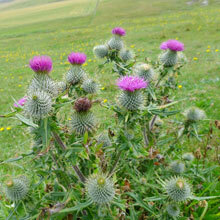 It is interesting to note that Gullane is so named from the Gaelic for “shoulder”. 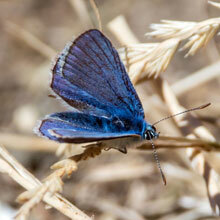 I noticed that the grassy banks at the foot of the crags were teeming with butterflies. 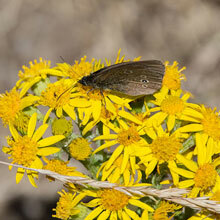 I got some nice shots, first of a Ringlet on Common Ragwort, then of a beautiful male Common Blue. 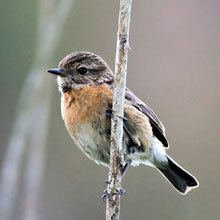 Females are not blue though, but, brown with orange spots at the edges of their wings. 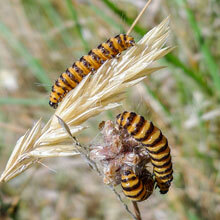 We saw many orange and black-striped Cinnabar Moth caterpillars, mainly on Ragwort. 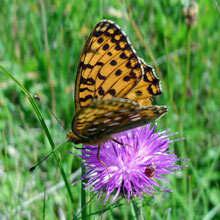 I got quite excited to come across a Dark Green Fritillary Butterfly feeding on Knapweed. 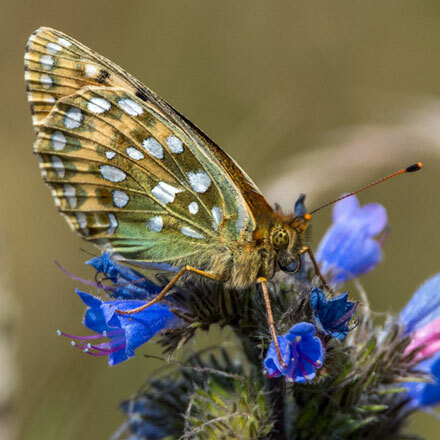 Although these large, powerful butterflies are predominantly orange with brown /black markings, there is a dark green tinge at the base of the underwing (see “Pictures of the Week”, below) from which it gets its name. 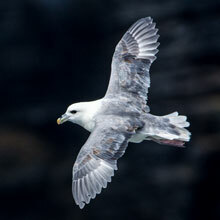 We descended back onto the shore as John had spotted a gathering of birds just off Gullane Point. 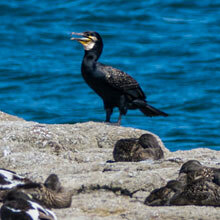 Prominent amongst these was a juvenile Cormorant standing over a large group of eclipse Eiders. 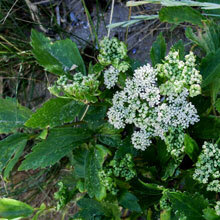 As we rounded the Hummell Rocks I noticed an umbilifer with quite unusual leaves. 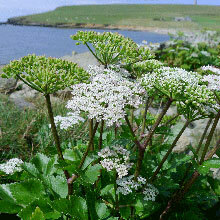 It was Scot’s Lovage, an edible plant, with the flavour of celery. 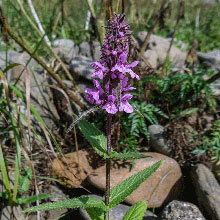 In the UK it is only found on coasts, although, since it cannot tolerate grazing, it is seldom found where sheep and birds are seen. 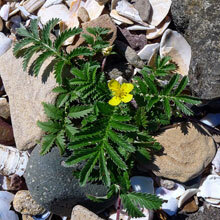 I took a photo of a pretty little Silverweed growing neatly on the pebbles of the foreshore. 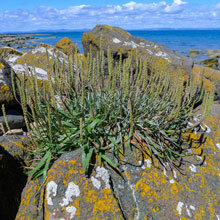 I also recorded a large plant of Sea Plantain that had established itself on a raised boulder. When photographing plants, to ease identification, I like to get shots from long and medium distances followed by close-ups of flowers, leaves and stem. 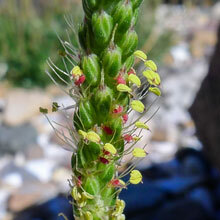 As I examined the close-up of the Plantain I noticed one showed an infestation by tiny red mites - plant-eating spiders, Tetranychus urticae. 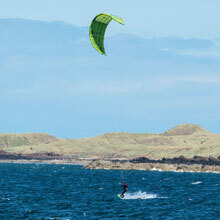 John drew my attention to Gullane Bay where kite-boarders were having fun in the sun. We rested a bit on the grassy edges of the Point where I captured images of the Small Heath butterfly and a Plume Moth that I think is the Yellow Plume Moth, Gillmeria pallidactyla. 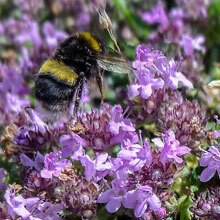 I also watched an industrious White-tailed Bumblebee pick its way through the small flowers of Wild Thyme. 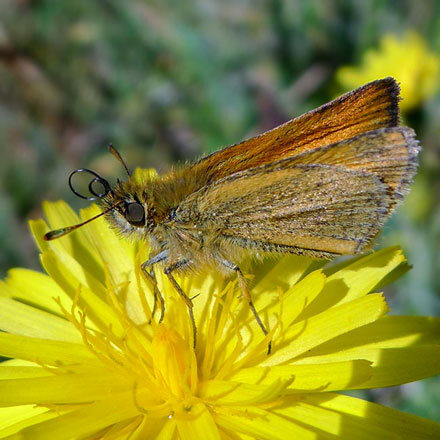 A Small Skipper butterfly, aptly-named, as its wingspan is only 30mm, landed on Coltsfoot and hung around long enough for me to get some great shots. 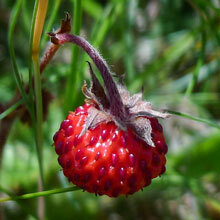 The grass at the Point was not all that tall, so there were other flowers growing there, such as the Wild Strawberry. Once we had noticed them (they were about half the size of cultivated strawberries) we realised that there were rather a lot of them hiding beneath the grass. On our return journey we took a different route after we passed the Hummell Rocks. We found a footpath that ran the length of the crags from the beach up to the car park. 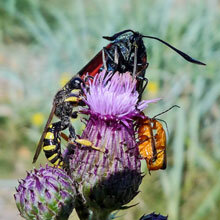 I found a trio of insect species busy on a Creeping Thistle. There was a Digger Wasp, Ectemnius cephalotes and a 6-spot Burnet Moth, each feeding, and a pair of copulating Red Soldier Beetles. 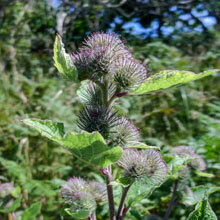 We passed a couple of Lesser Burdock plants that were just ready to flower. 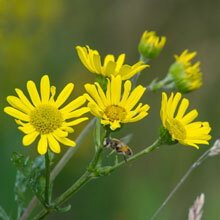 Folk medicines prepared from the plant include treatments for snakebites, rabid dogs, burns, sores ulcers, sciatica and many more. 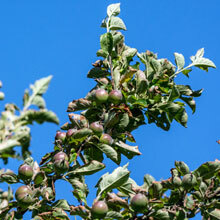 I was surprised to find an Apple Tree perched precariously on the cliff side, although it would be a brave person who would try to pick them. 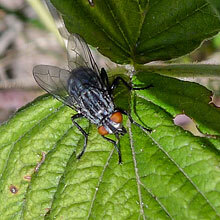 John pointed out a red-eyed, grey-striped parisitoid fly called Nemorilla Floralis. 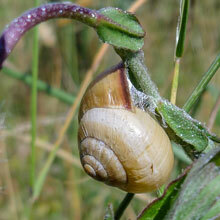 (The final adjective refers to its habit of it laying its eggs inside certain butterflies and moths, where the fly larvae then develop).Our final shot was of a Brown-lipped Snail in what could be a “estivation” - when the atmosphere is dry it retracts into its shell and becomes inactive until the moisture in the atmosphere increases. By the time we reached the car we were both fairly tired, ( I was completely and utterly......tired. ED.) due to the rock scrambling required throughout the trip and our final trek up the hill. Time then for Almond and Custard Danish Pastries, washed down with cups of strong tea - all in the shade of the hatchback door. For the second week running we found ourselves enjoying the fine breakfasts of the Kilmarnock Asda Cafe (9.75/10 - 2 week average). Like the previous week, the weather was warm and sunny. 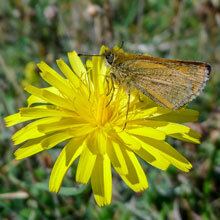 We were heading for SWT Gailes Marsh to check out the flowers and insects. 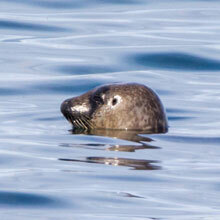 First though, while the tide was favourable, we started at Troon Harbour. 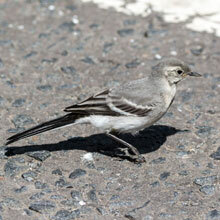 As we got out the car, a juvenile Pied Wagtail (although it may be a juvenile White Wagtail) was foraging around the car park. 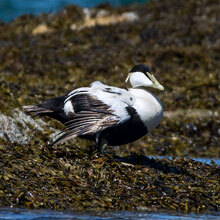 We decided to walk North along the shore towards some Eider we spotted. 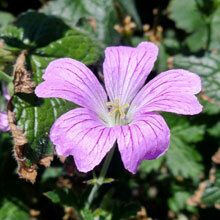 A big clump of what looked like Cranesbill decorated the approach to the shore. 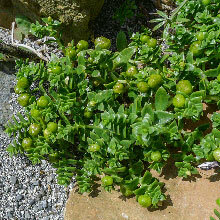 There was lots of Sea Mayweed and Sandwort. The daisy-like Mayweed carries a slight scent similar to Chamomile The only bird we could see on the rocks was a lone Herring Gull, which disappointed us as we had expected a few waders. 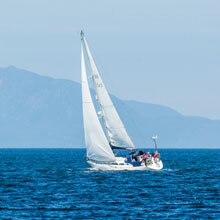 Then as I took in the beautiful vista before us, of yachts sailing on azure sea with the Isle of Arran in the distance, some movement on the rocky shore in front of me caught my eye. 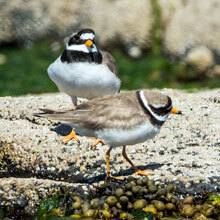 It was a pair of Ringed Plovers scurrying across the shore seeking out flies, spiders, marine worms, small crustaceans and molluscs. 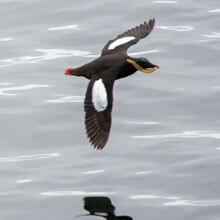 Then, as as couple of vessels entered the Harbour, I spotted a Black Guillemot skimming the water before coming to rest on a ledge of the Harbour wall. 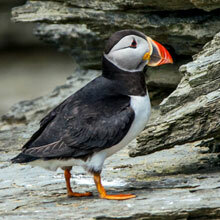 These birds are in the Auk family (which includes the Puffin). 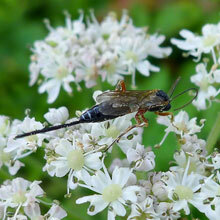 Those in the UK are Cepphus grylle arcticus, one of 5 subspecies found world-wide. 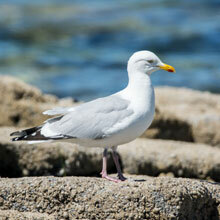 After a time it flew off into the harbour. 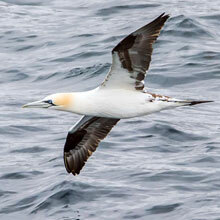 After that we had a fairly close fly-past of a Gannet, probably it was on a day trip from Ailsa Craig. 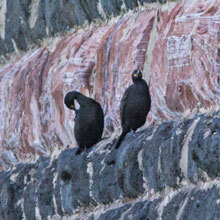 John pointed out a pair of Shags sitting at the end of the same ledge of the wall that the Black Guillemot was on. A lonely Oystercatcher landed by some seaweed before I managed to spook it in my clumsy attempts to get a closer picture. 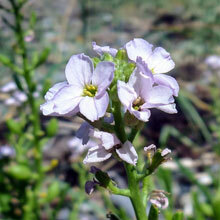 As we returned to the car park I snapped a shot of Sea Rocket. 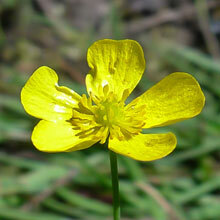 This plant is a member of the Mustard family. We next explored the south side of the shore. 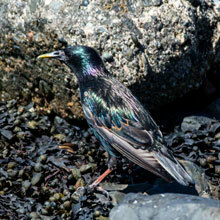 My eye followed an adult Starling picking its way across the rocky shore. 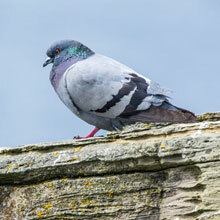 Its plumage was very iridescent, in the strong sunlight. 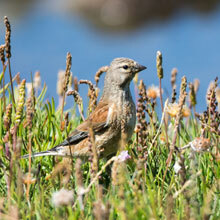 We startled a small group of Linnets we hadn’t noticed as they fed amid patches of long grass on the rocks. 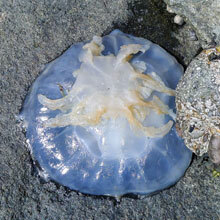 John drew my attention to a dead Jellyfish that had probably been stranded in a temporary rock pool. 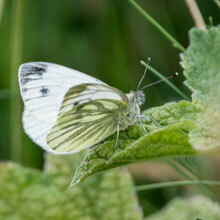 On our way back to the car I photographed a Small White butterfly as it rested on grass by the path. It is also called the Small Cabbage White, distinguishable from the Large White by its small spots and black tips to its forewings. 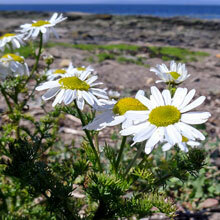 It was a short drive North up the coast to Gailes Marsh, a Scottish Wildlife Trust Reserve south of Irvine. 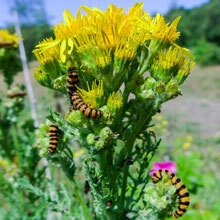 At the very start of the walk we found the first of many Common Ragwort plants that were festooned with orange and black banded Cinnabar Moth caterpillars. 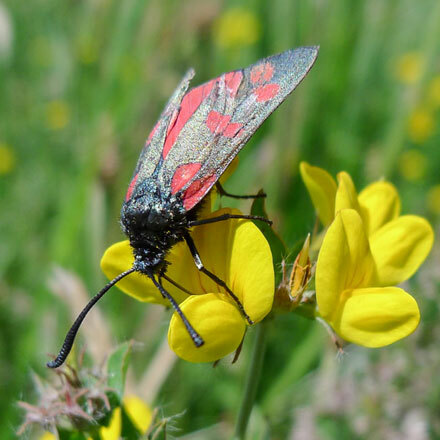 I liked the look of a Wild Rose further along the path and, as I photographed it, a 6-Spot Burnet moth whizzed past my head and descended onto a Meadow Vetchling flower. So I photographed it too. We were watching out for dragonflies so we sat close to the Marsh and waited for them. 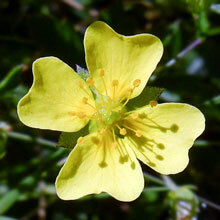 I soon came across a few plants of Lesser Spearwort, a member of the family of Buttercups. 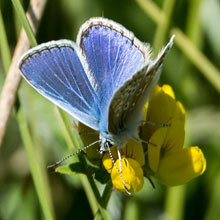 On our walk to the marsh we had noticed the many Common Blue butterflies darting about. 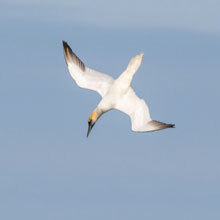 They didn’t land too often, and when they did they didn’t stop long enough for me to snap them. 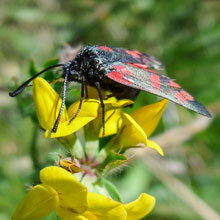 At the marsh we decided to wait for them coming to us - well, to the Birdsfoot Trefoil we had sat beside. It paid off as before too long I got a passable shot. 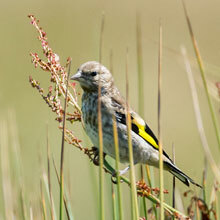 A wee Goldfinch juvenile sat nervously in a nearby bush before its nerves got the better of at and it flew off. 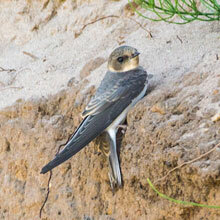 We came upon a sand bank where we watched the comings and goings of Sand Martins feeding their nestlings. As time was getting on, and although we had seen no dragonflies, we pressed on around the path that would lead us back to the car. 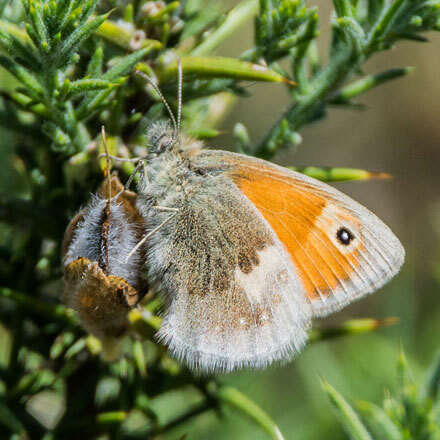 John pointed out a Small Heath butterfly on some Gorse (see “Pictures of the Week”, below). 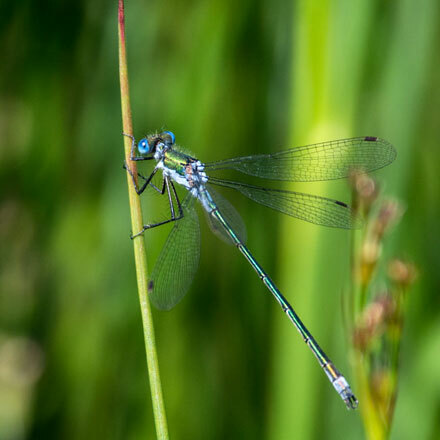 Immediately after this I located a male Emerald Damselfly (also below) clinging to a reed. 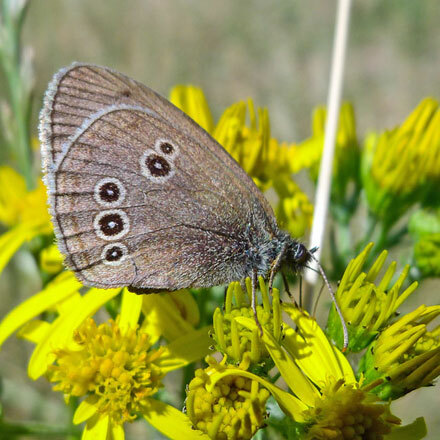 The final leg of our route took us past a open area of tall grasses bordered by elegant Common Valerian plants and lower, but lovely patches of Tormentil with their tiny yellow flowers. 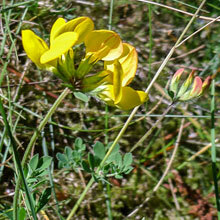 Thirty metres from the car I found two members of the same species, Common and Greater Bird’s-foot Trefoil. 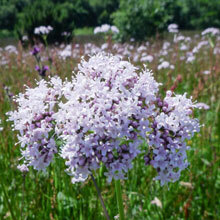 They differ as you might expect - the Greater is taller and has bigger leaves. 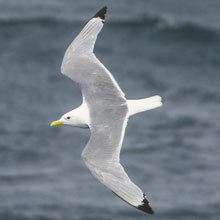 Yet another very enjoyable outing to two very different locations, each of them yielding some interesting sightings. The accompaniment to our tea this week were jam and cream-filled muffins, a very satisfactory end to the day.